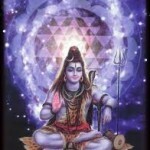 The Sri Rudram hymn is an invocation to Lord Shiva. 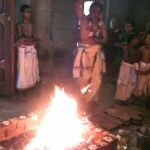 It consists of two parts, namely the Namakam and the Chamakam. The Namakam sings the glory of Lord Shiva and the Chamakam consists of prayers to the Lord asking Him to grant the devotee material and spiritual grace.. Now each of the Namakam and Chamakam consists of eleven chapters called as ‘Anuvakams’. – Routine chanting of Sri Rudram is called ‘Roopam’ and consists of chanting the Namakam once and the Chamakam once. 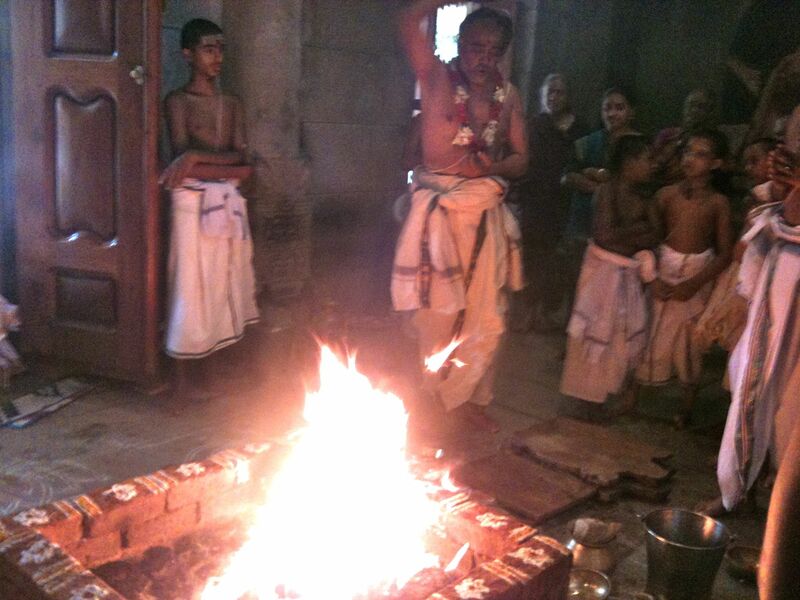 – Eleven recitations of Namakam followed by one recitation of Chamakam are called ‘Ekadasa Rudram’. 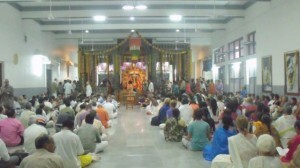 – Eleven rounds of Ekadasa Rudram chanting constitute a ‘Laghu Rudram’. 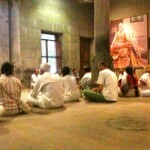 – Eleven rounds of Laghu Rudram chanting constitute a ‘Maha Rudram’. 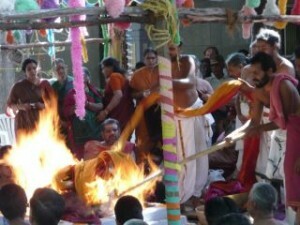 – Eleven rounds of Maha Rudram chanting constitute an ‘Athi Rudram’. 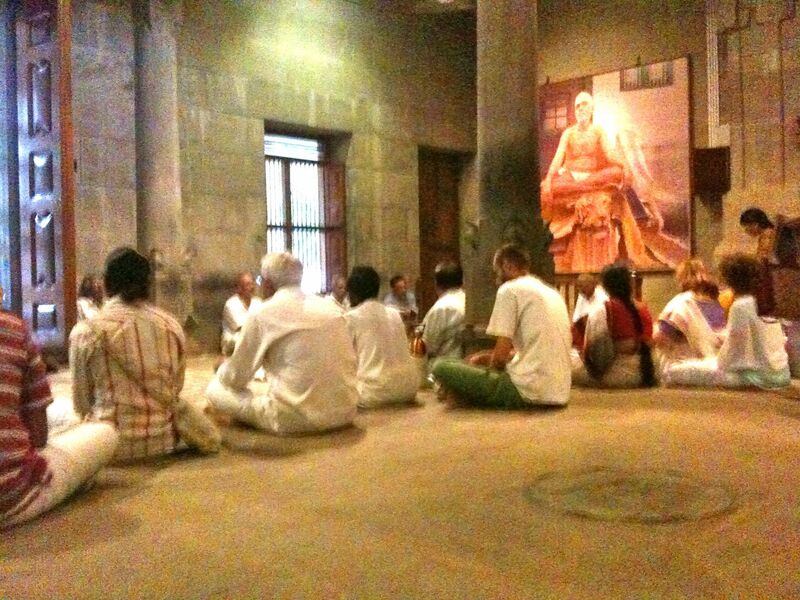 If eleven Ritviks chant the Ekadasa Rudram simultaneously, that would result in completing a Laghu Rudram. 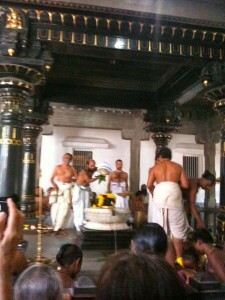 If 121 Ritviks chant the Ekadasa Rudram simultaneously that would result in completing a Maha Rudram. 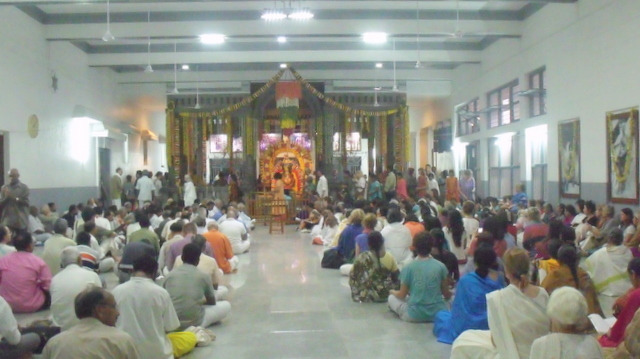 Typically, a Maha Rudram is completed in one day resulting in the chanting of the Rudram 1331 (121×11) times. “Arunachala Shiva Arunachala Shiva, Thou dost uproot and annihilate the ego of those who meditate on Thee in their hearts, O Arunachala” so begins the classic Arunachala Akshara Manamaalai hymn composed by Bhagavan Ramana in 1914 and sung almost every day by Him and devotees from then onwards right upto the last moments of his earthly manifestation. These sublime 108 verses brilliantlly combine the strengths of Jnana (knowledge) and Bhakthi (devotion) and thus appeal universally to every spiritual seeker and devotee of the Eternal Absolute Truth, call it God, call it the Self..
For what is Arunachala but the Heart of every being! The garland that weds us to the Akshara (the indestructible)is called Akshara manamaalai. There is a subtle word play on the word akshara as it means both letters and the indestructible. 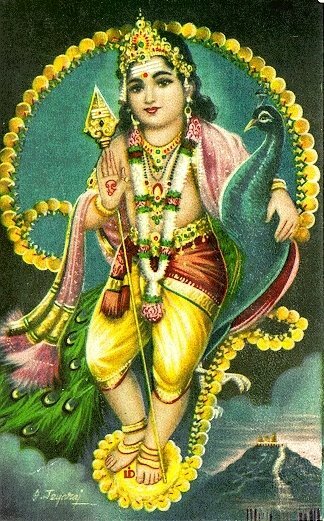 Sri Muruganar composed a prelude to this hymn which says, “Getting rid of the mind that mistakes this perishable, insentient body as ‘I’ and turning it inwards to merge firmly in the Heart, realize the effulgence within as the Truth of non-dual pure awareness. 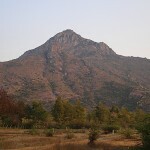 This is the truth of Arunachala, the Heart-centre of the universe”. The Na Karmana slokam from the Upanishad is chanted in Ramanashram every evening after the Sri Rudram vedaparayana. Neither by actions, nor by (aquiring) progeny and wealth, but by renunciation alone is immortality attained. (That Supreme State ) is far beyond the highest heaven, and the sages perceive it, hidden in the cave of the heart, shining brilliantly therein. (Those) sages, who have a clear understanding of the principles of Vedanta, who have purified themselves by means of the yoga of renunciation,and who are (thus) established in the state of supreme beatitude, are totally liberated in Brahman at the time of dissolution of the body. That which is described as the primal sound (om) in the beginning of the vedas, has been fully established as the supreme truth at the end of the Vedas ( the Upanishads) . The one who realizes that Supreme Principle is beyond the pale of those totally immersed in physical realities. Indeed, He is none other than the supreme Lord ! Brahmaloka may be interpreted subjectively or objectively. The latter meaning requires faith in sastras which speak of such lokas, whereas the former is purely of experience and requires no external authority,. Brahmaloka means Brahma Jnana or Atma Sakshatkara. Deathlessness is not obtained through action or begetting offspring or wealth. Some attain that state through renunciation. The Sages that have conquered senses, attain that Sat which is more supreme than Heaven and shining all alone in the Heart. The adepts who by renunciation and one-pointedness are pure in heart and have known for certainty of Truth by the special knowledge proclaimed by Vedanta, get fully released in the Brahmaloka from the causal Maya at the dissolution of the body. That alone which shines as the tiny akasa void of sorrow, in the lotus heart, the tiny seat of the spotless Supreme in the inner core of the body is worthy of worship. He alone is the Supreme Lord, who is beyond the Primal Word which is the beginning and end of the Vedas and in which merges the creative Cause. 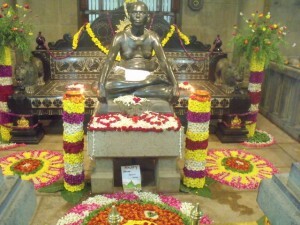 Mahapuja is the anniversary of the Mahasamadhi day of Bhagavan Ramana Maharshi’s Mother. It is celebrated every year in the Ramanashram inside the Mathrabhutheswara shrine where the Mother’s mortal frame was buried. This year it took place on !3th June. 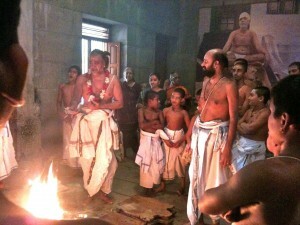 At the time of his mother’s passing away, Bhagavan recounted, “Mother said she would not leave me and go anywhere else. If she went anywhere she was afraid that she might die there. She was particular that she should die in my hands. She used to say, “even if you throw away my dead body in these thorny bushes i would not mind but i must end this life in your arms”. Here is an account of the Mother’s death by Suri Nagamma in Letters: In 1922 mother’s health broke down. 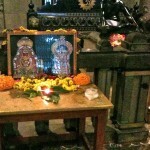 On the festival of Bahula Navami, which fell that year on May 19th, it was obvious her end was near. 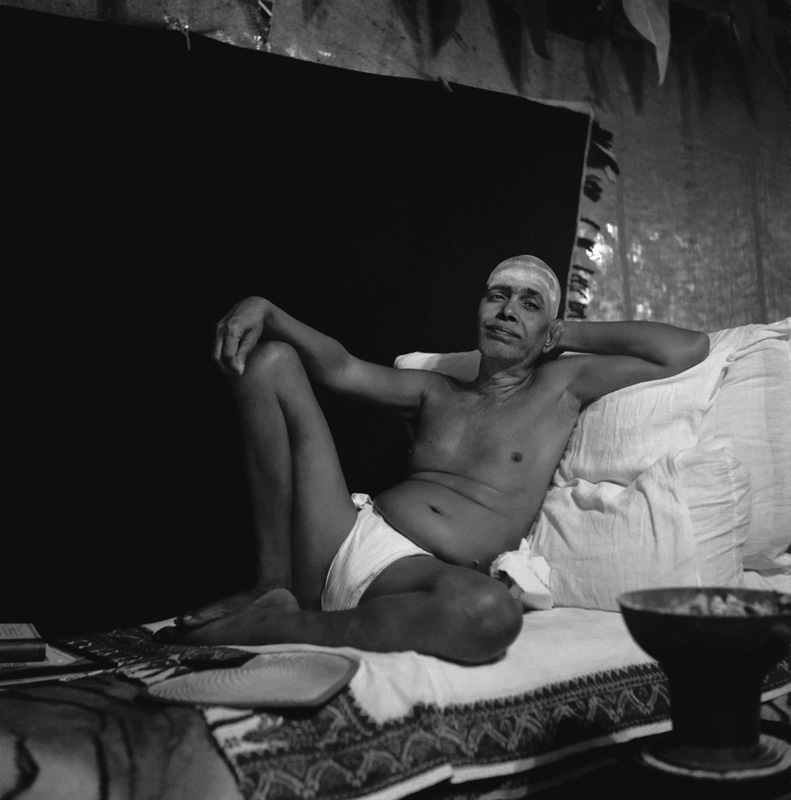 After his usual morning walk Bhagavan entered mother’s room and waited on her the whole day, even taking his afternoon meal in the room. About sunset the evening meal was prepared and Bhagavan asked the others to eat, but he himself did not. In the evening the devotees sat beside mother in 3 separate groups singing the marital garland of letters. For a further 2 hours she lay there, her chest heaving and her breath coming in loud gasps; all this while Bhagavan sat beside her, and during the last hour he laid his right hand on her heart and his left on her head. There was no question of prolonging life but only of quieting the mind so that death could be Mahasamadhi, absorption in the Self. Later Bhagavan explained, “innate tendencies (vasanas) and the subtle memory of past experiences leading to future possibilities became very active. Scene after scene rolled before her in the subtle consciousness, the outer senses having already gone. The soul was passing through a series of experiences, thus avoiding the need for rebirth and so effecting union with Supreme Spirit. The prana was absorbed in the heart and the soul was at last disrobed of the subtle sheaths before it reached the final destination, the Supreme Peace of Liberation from which there is no return to ignorance”. 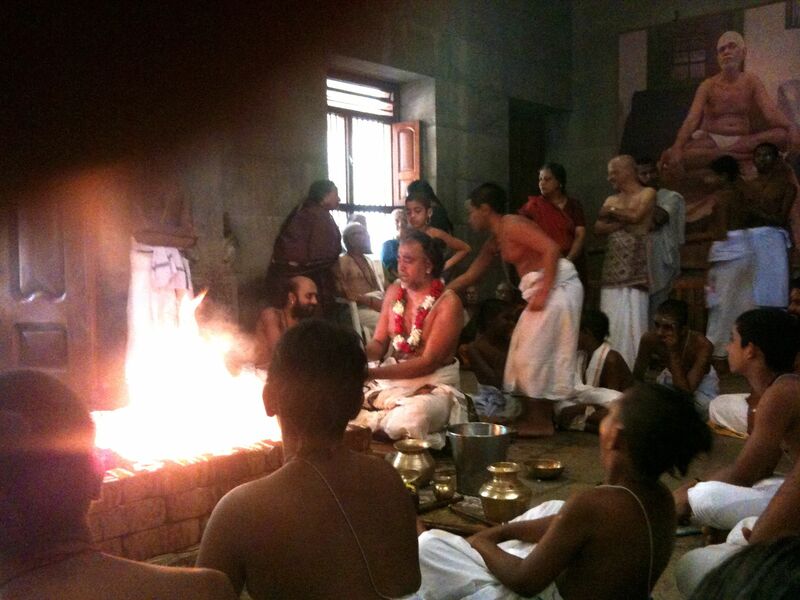 Every year in the month of March, Sri Vidya Havan is conducted in Ramanashram with great devotion and sacred energy. The Sri Chakra inside the Mathra Bhutheswara temple which was installed and consecrated by Sri Bhagavan himself is thus re-consecrated. 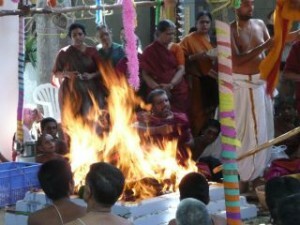 During the Havan, Saraswathi the goddess of knowledge is invoked and worshipped with rituals and chanting according to ancient vedic doctrines. Towards the culmination, silk saris, gold ornaments, money, coconuts and lotus flowers are offered into the sacrificial fire. 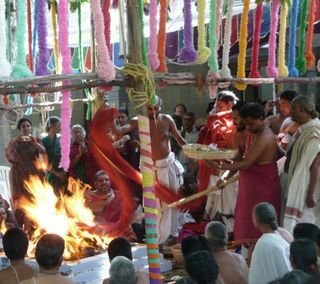 The fires of the homam then leap up with greater vigour and one can almost see the divine mother dancing out of the flames and blessing all the devotees with her power. There is a tremendous wave of energy which arises around and one is well rewarded for having braved the summer heat and partaken in this hot and firy event. 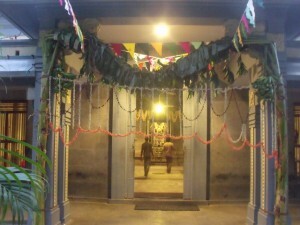 The many kalasams of holy water which are consecrated during the homam are then taken into the shrine through an elaborate procession and later abhishekam is performed on the Sri Chakra and the deities inside the sanctum sanctorum with these waters. Maattu Pongal the third day of the Pongal or Harvest festival is the day consecrated to the cows. 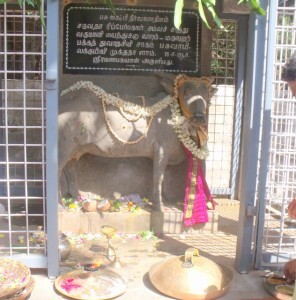 Everywhere, on this day, cows are bathed and decorated with flower garlands and then puja is performed to them with offerings of sweet pongal and fruits. 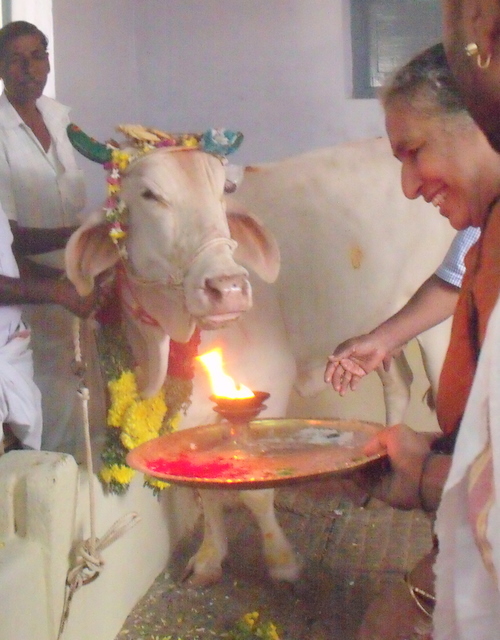 In Ramanashram too, it has always been the tradition right from the time of Bhagavan to celebrate Cow Pongal in a graceful way. 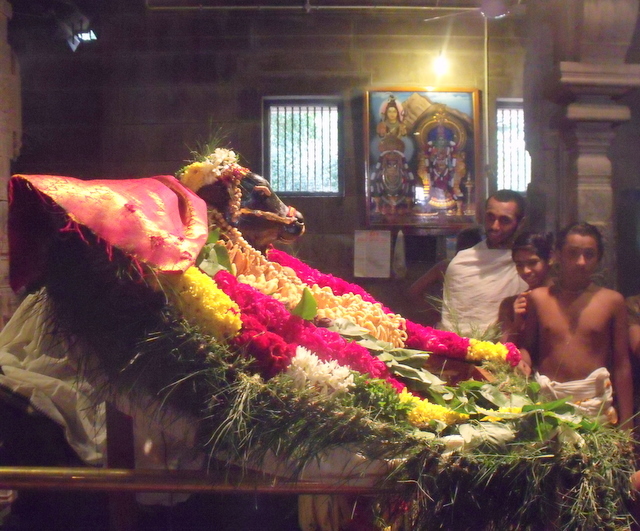 Devotees will remember that Sri Ramana was very fond of the cow Lakshmi and He used to feed sweet pongal to Lakshmi with his own hands on Cow Pongal day. 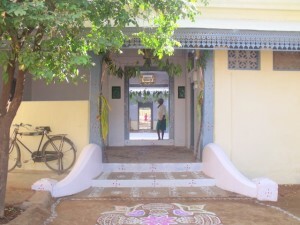 The Maatu Pongal celebrations in the Ramanashram consist of 3 different ceremonies. 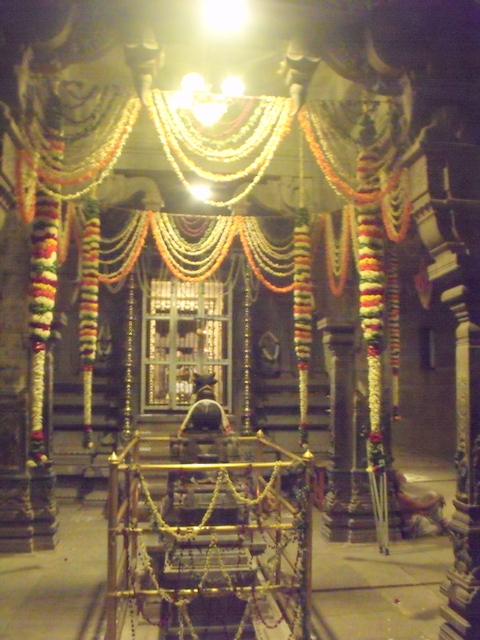 First the Nandi (bull mount of Shiva) in the Mother’s shrine is decorated in a spectacular way. 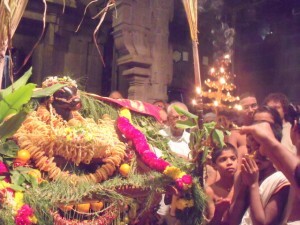 He is adorned with garlands of vegetables, fruits, sugarcane, grass, flowers. Vadais and other tasty sweetmeats. 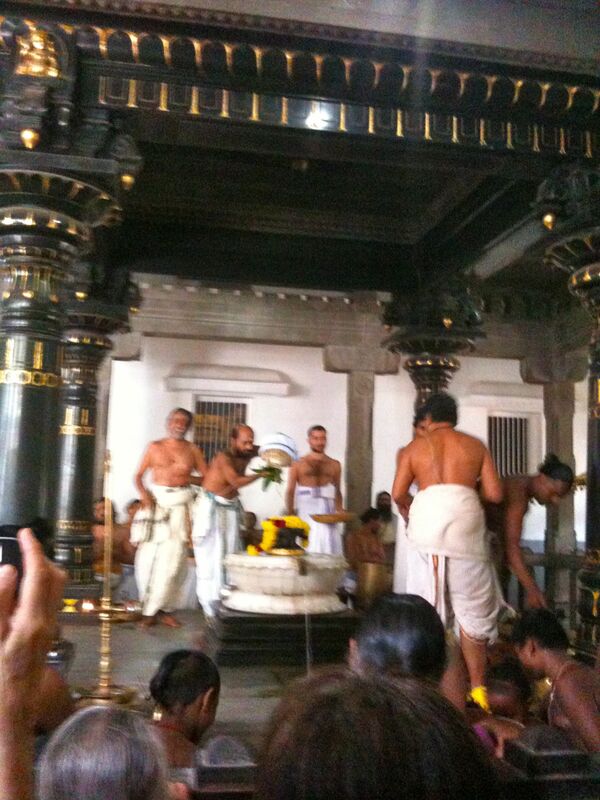 Then an elaborate Aarathi puja is performed by the priests with devotees looking on with rapt admiration. The next event takes place at the Samadhi (tomb) of the cow Lakshmi which is located outside in the open courtyard beside the dining hall. A group of devotees are assembled here and the statue of Lakshmi is bathed with milk abhishekam and then a puja is performed with the photo of Bhagavan fondling Lakshmi placed in front. The ashram ladies sing many beautiful hymns in praise of Lakshmi describing her devotion to Bhagavan and other touching episodes in her life like how she used to give birth to a calf every year right on Bhagavan’s birthday. 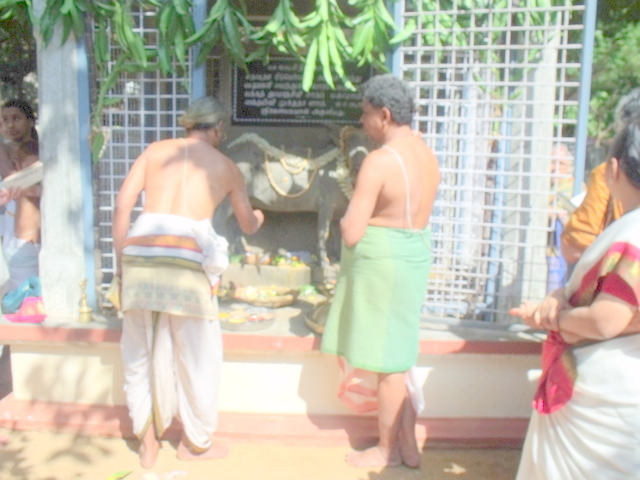 This creates a wave of devotion among the group and many devotees are moved to tears to listen to the words about the cow Lakshmi’s unusual and rare bhakthi to her Master and how, even though she was in the body of an animal she behaved like a deeply spiritual human being . 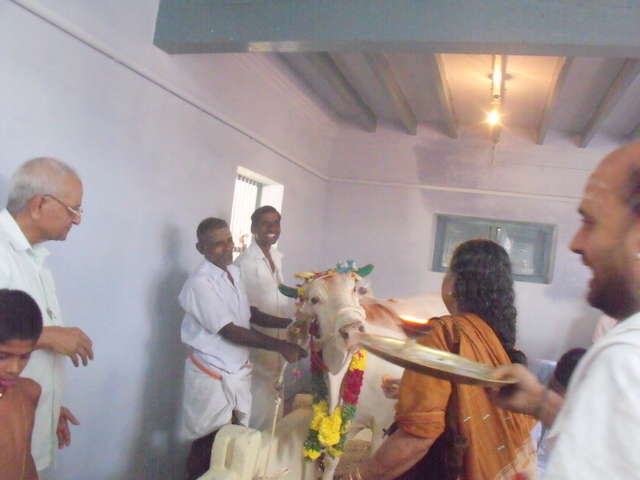 The third event takes place in the cow shed of the ashram, called ‘Goshalai’. 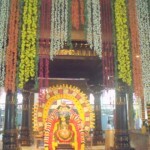 Inside, it is nicely cleaned and beautifully decorated with flower garlands and sugar cane and turmeric plants. 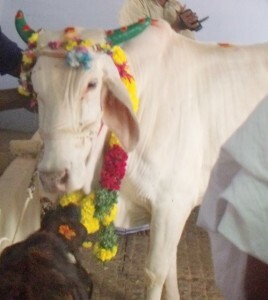 In the centre, a lovely white cow (believed to be the descendant of Lakshmi) and her calf are decorated and honoured. 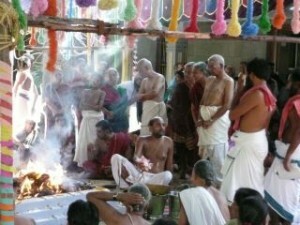 A puja is performed to them by the ashram priests with the same respect and energy as they would to a deity in the temple. The president and his wife feed the white cow with sweet pongal from their own hands and the cow and calf eat it with quiet relish. It is an enchanting scene and one feels transported to times of yore when cows were considered as godly beings and people treated them with respect and devotion. Let us follow the example of Bhagavan Ramana and recognize and respect the Divine Being in every fellow creature on this earth. The birth anniversary of Bhagavan Sri Ramana Maharshi is celebrated as Ramana Jayanthi in the Ramanashramam every year. The date is calculated according to the Hindu almanac and thus takes place on the Punarvasu star day in the month of Maargali or Dhanur (Dec-Jan). This year it took place on Monday 9th January. 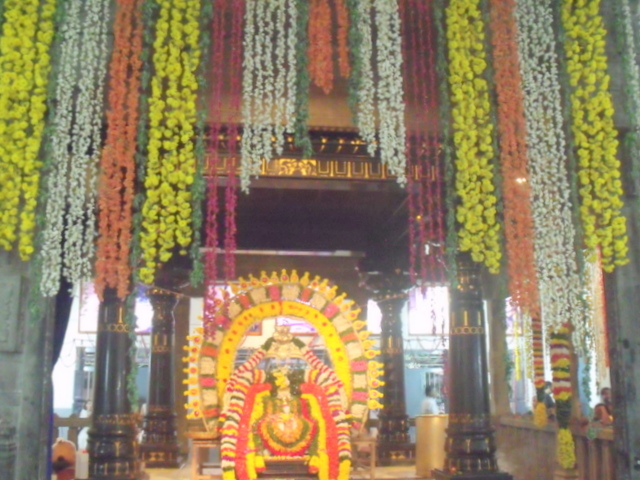 The main puja of the day is the Maha Ekadasa Rudhrabhishekam and it is performed on a grand scale in the shrine of Sri Ramana’s Samadhi. 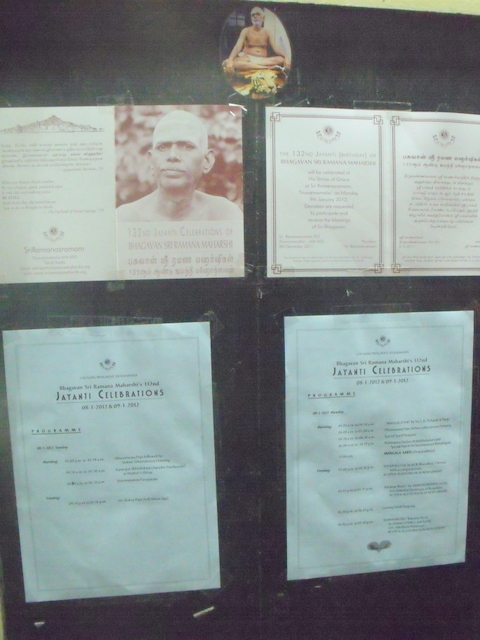 Apart from this, the ashram had a number of other special events like bhakthi chantings, music concerts and spiritual discourses on the life of Sri Ramana. 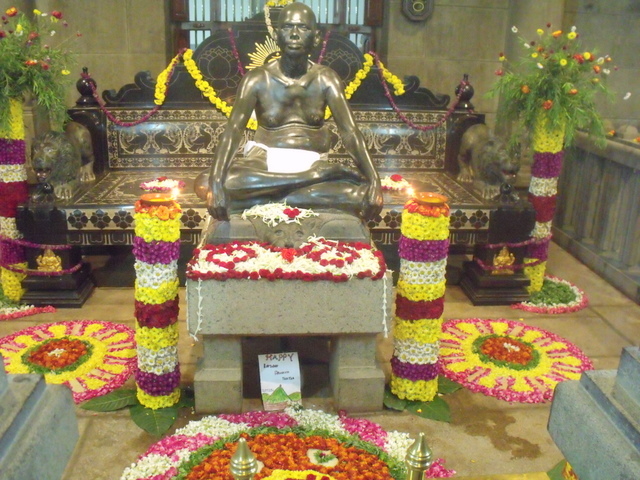 The highlights of this year’s Jayanthi celebrations were the splendid floral decorations over the samadhi shrine and in front of Ramana’s statue in the new hall. 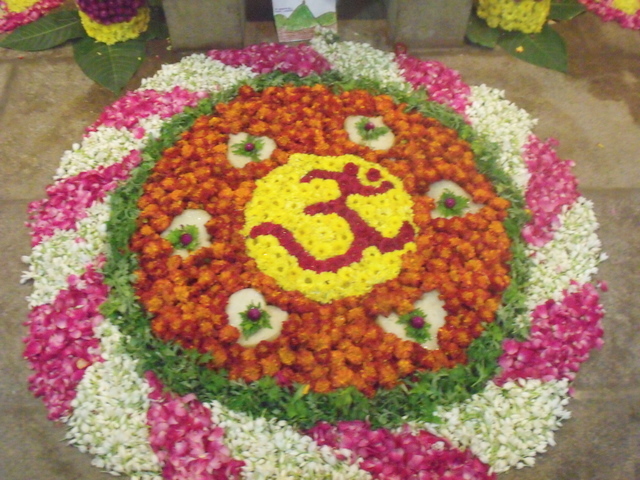 They were made with real flowers and had been arranged very beautifully, thus drawing the eye of every devotee who entered the hall. 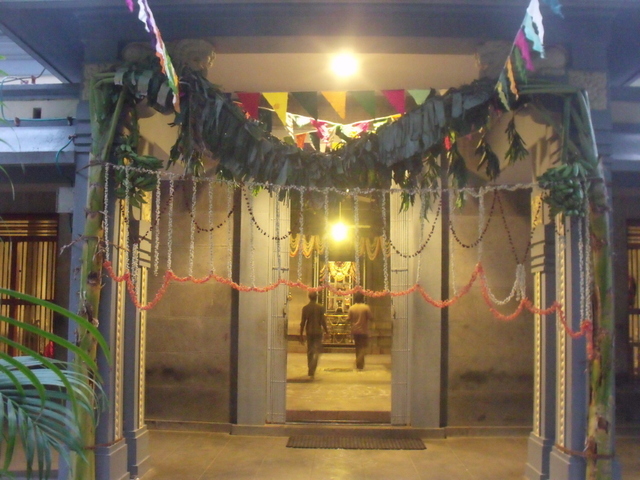 It must have taken a lot of painstaking work for many hours and one cannot but exclaim in praise of the wondrous beauty of these flower festoons and kolams which transformed the plain hall into a place of splendid celebration. The music concert in the evening was held in the fantastic new auditorium and this was yet another pleasant surprise for devotees. Built in the style of a roman amphitheatre, this auditorium is cool and airy, has great accoustics and seems well equipped in lighting and sound systems. 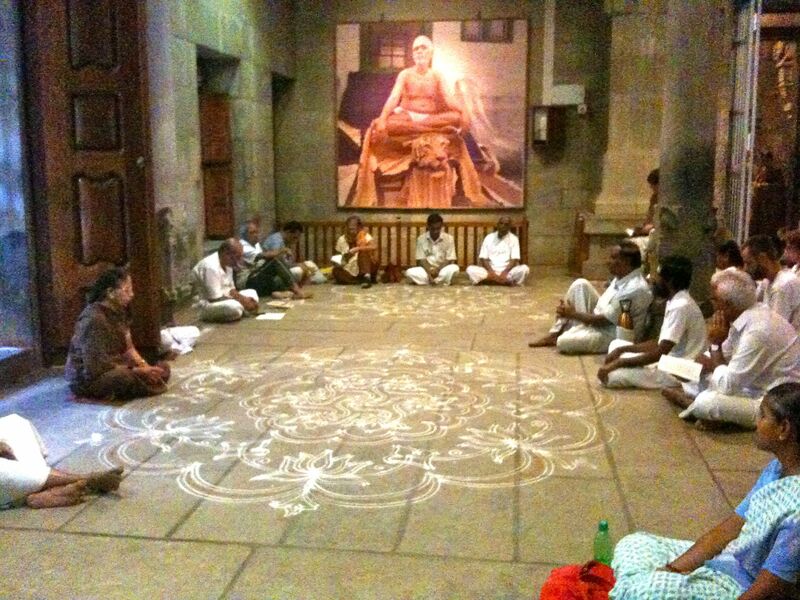 So it was really enjoyable to sit inside and listen to the lovely, melodious songs in praise of Ramana rendered by the troupe from the Ramana Maharshi centre for Learning in Bangalore. 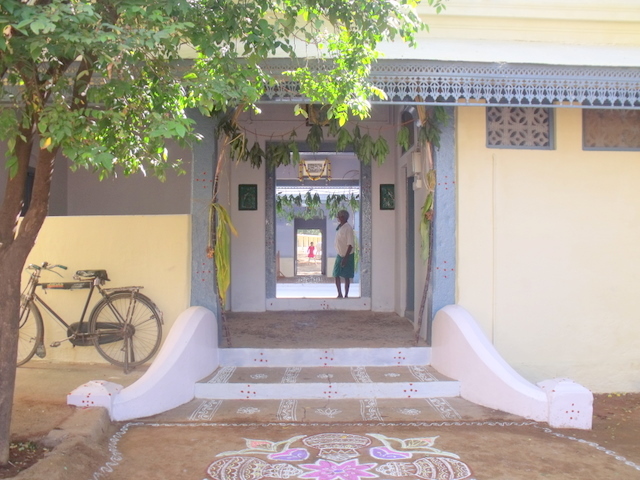 Thank you Ramanashram for this wonderful Jayanti and thank you Ramana for lighting the light of Truth in all our hearts ! 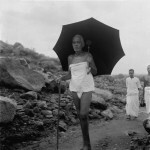 Devotees of Arunachala are well aware of Giri Pradakshina but what is Atma Pradakshina? 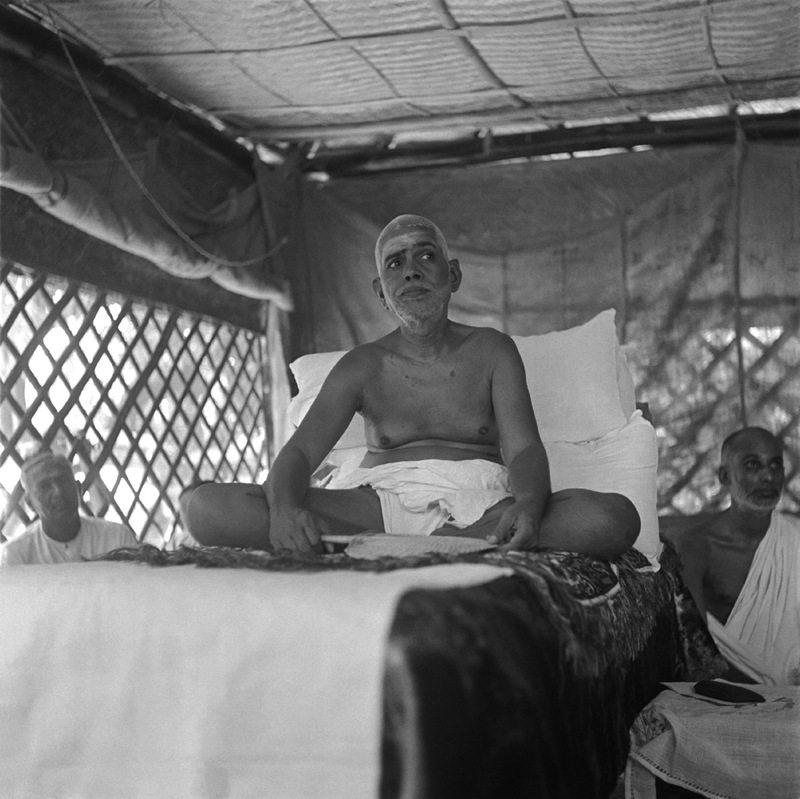 To find out let us go back to a certain day in May 1946 when Bhagavan was still present physically in the ashram. 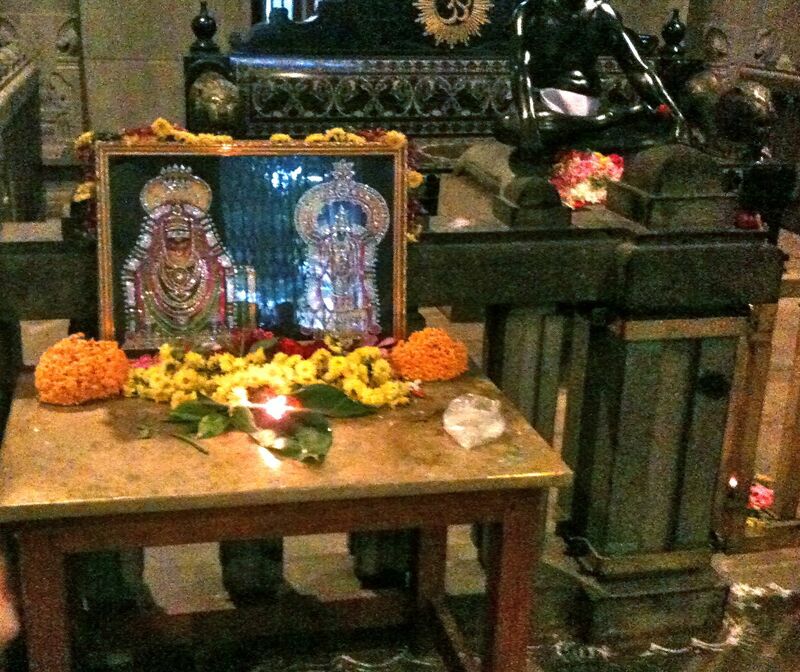 On that day, Sundaresa Iyer, a devotee who used to bring food for Bhagavan came and bowed before him. Bhagavan asked him, “Did you go around the hill by way of pradakshina ?” “No, said the devotee.” To this Bhagavan said, “last night when people were going out for giri pradakshina because of the moonlight, he also started to go. But he felt he could not complete the round. When they were starting out after telling me, he went around me quickly. When I asked him why he did so, he said, I am afraid I cannot go round the hill. 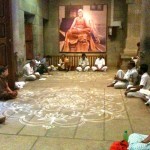 So I have gone around Bhagavan.” “Go round yourself. That will be Atma pradakshina”, so saying Bhagavan began laughing. 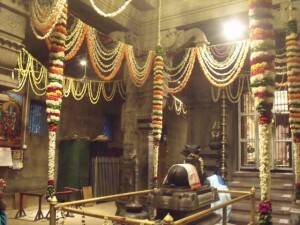 Here Bhagavan narrated a relevant story: “Once upon a time, Lord Shiva wanted to teach a lesson to his son Subramanya who fancied himself to be a great sage; so Lord Shiva sat on the top of Mount Kailasam with Parvathi, holding a wonderful fruit in his hand. 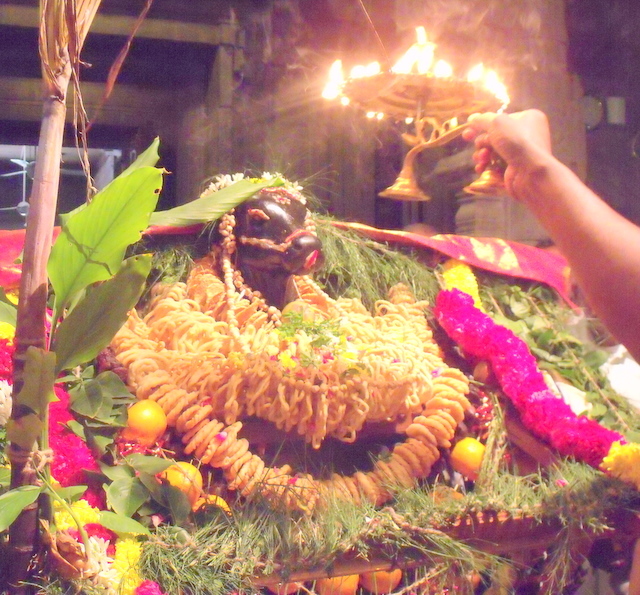 Seeing the fruit, both the sons of Lord Shiva, Ganesh and Subramanya each asked their father Shiva to give it to him. 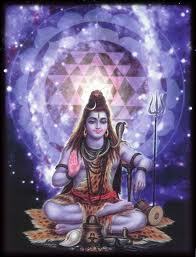 To this Shiva said that he would give the fruit to whoever of them got back first after going round the whole world. 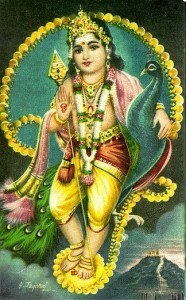 With confidence and pride that he would win the race, Subramanya started immediately riding on his favorite mount, the peacock and began going at a fast pace, frequently looking behind to assure himself that his elder brother Ganesh was not following. What could poor Ganesh do, with his huge belly? His mount was after all a mouse. So he thought it was no good competing with Subramania in the race around the world, and instead went around his parents Lord Shiva and Goddess Parvathi, bowed before them and claimed the reward. When they asked him to justify his action he replied, “All the worlds are contained within you; so if I go around you, it is as good as going round the whole world.” Pleased with his reply, Shiva gave him the fruit and Ganesh started eating it with pleasure. 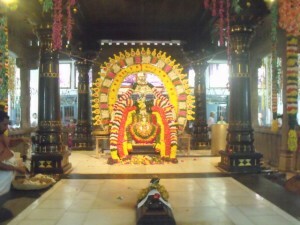 In full confidence that he would be the winner, Subramanya completed his world tour very fast and flew back to Kailash to claim his reward, the fruit from Shiva. To his consternation he found Ganesh sitting there and calmly eating it. 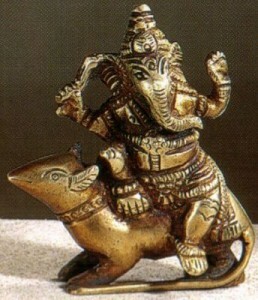 Enraged he shouted and asked how that could be, it was unfair and he never saw Ganesh going around before him. So Lord Shiva patiently explained to Subramanya what had happened and how Ganesh came to claim the reward. After hearing this, Subramanya felt ashamed and and realised how full of vanity and pride he was. He bowed humbly before his parents and asked to be pardoned. That is the story. The significance of this tale is that the ego which goes round like a whirlwind must get destroyed, and must get absorbed in Atma. That is the meaning of Atma Pradakshina” finished Bhagavan.